Find your center … keep the faith … soldier on in peace! The faster you find your center and anchor in it the more peaceful and happy you will be. I completely relate to Brooks’ perspective. You can too. Just look around you. 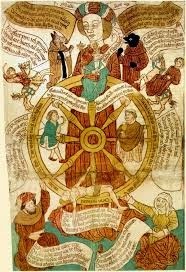 You will not find one human being who is not touched by this wheel’s movement. Around you and me are millions of stories of people who were once blessed with health, wealth and reputation who are now struggling with none of these. And you will find millions more, who were unknown, unheard of, making it to the limelight, gain wealth and living an abundant Life. The only thing constant about Life is this change of position if you are at the periphery. But if you choose to be detached, if you choose to let go or reach the state of willingness to let go, you will be unmoved by everything and anything that happens to you. Whether you are up or down, whether you are gaining or losing, whether you are on a high or a low, nothing will matter. Because at the center, you are untouched, and, therefore, unmoved. Through the experience of our bankruptcy and from being penniless in Life, I have learnt the value of finding my own center. I realized that I am not my bankruptcy; I just happen to be in a bankrupt state. This does not mean that I am poor. I reasoned that I am rich with my experience, with my expertise and with my learnings from Life. It became clear to me that it just so happens, that for an extended period of time now, I don’t have money. This clarity emerged in my mind when I understood the power of finding my center. I found my center thanks to a quote I read that is attributed to Swami Vivekananda (1863~1902): “Live in the midst of the battle of Life. Anyone can keep calm in a cave or when asleep. Stand in the whirl and madness of action and reach the center. If you have found the center, you cannot be moved.” Until I read this quote, I would be consumed by anxiety and worry, I would snap at every provocation and break down for the smallest of reasons. But Vivekananda inspired me. I took to the practice of mouna (observing daily silence periods). And through that practice, over a few months, I found my center. I still live, with my family, in the throes of our abject and challenging financial condition. But I must report that I have learnt to be at the center of my Life’s wheel. And, let me add, it’s a blessing to be at the center. Living at the periphery always has this feeling of inbuilt insecurity – what if you are blown away? But living at the center means you know you will be provided for, taken care of, and will be given all that you need. Being at the center also means, therefore, keeping the faith. If you are struggling with an imponderable – a health, money or relationship situation – try finding and moving to your center. That’s the only way you can soldier on in peace! Author AVIS ViswanathanPosted on December 19, 2014 March 14, 2016 Categories Art of Living, Arthur C Brooks, Fortuna, http://schemas.google.com/blogger/2008/kind#post, Inner Peace, Intelligent Living, Mouna, Rota Fortunae, Swami Vivekananda, The New York TimesLeave a comment on Find your center … keep the faith … soldier on in peace!